This luxury one bedroom, seventh floor apartment directly on the Gulf of Mexico, with to-die-for views, is our own vacation paradise. We decorated and furnished it for our own pleasure. You'll love it too. Sliding glass doors from the living room and master bedroom open onto the wide balcony with spectacular views of the Gulf. The full mirrored wall in the living room and multi-mirrored master bedroom accentuate the water views from every angle. The entire apartment has high-quality ceramic tile, even the balcony. Enjoy breakfast, a romantic dinner, and/or an evening glass of wine on the super-comfortable patio furniture on the balcony overlooking our private lagoon, beach, and the open water of the beautiful Gulf of Mexico. 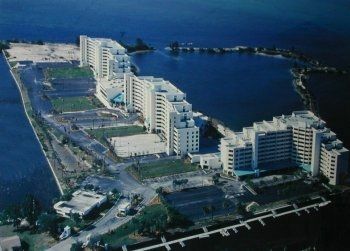 You'll see dolphins and manatees playing in the lagoon and fish jumping high in the air from the balcony. The master bedroom has a king-size bed with a luxurious mattress and a flat screen TV. You can see the Gulf of Mexico from bed! The second bedroom has a trundle daybed that can be made up as two separate single beds or a king-size bed. There's actually a water view from this bedroom too... of canals and the marina. The living room has a flat screen 37 inch HDTV with a DVD player and separate stereo/FM/CD player. High-speed cable AND wireless internet service are included free throughout the apartment, as well as 2 telephones with free local and long distance calling. The dining area features an imported Italian dining table that seats four when closed and opens up to seat eight comfortably, illuminated by a beautiful crystal chandelier. Of course the apartment is fully air conditioned and heated, but there are also overhead fans in every room and phenomenal cross ventilation that can make the apartment quite comfortable even without using the air conditioning. The modern kitchen includes all appliances: dishwasher, icemaker in the fridge, microwave, blender, toaster oven, coffee maker, water filter, and a stacked washer/dryer, so you don't have to go outside to do the laundry. Naturally, all the dishes, glasses, pots and pans, utensils, linens, and towels you'll need are there. Gulf Island Beach and Tennis Club is a gated vacation community with excellent 24-hour security at the gate. You could happily spend your whole vacation here, enjoying the huge heated pool, beach, four tennis courts, gym, luxurious club rooms (with library, big screen TV, pool table, ping pong, piano, dance floor, etc). You can enjoy our private nature walk and fish along the perimeter of the lagoon. Rent a boat at nearby Hudson Beach, charter a fishing boat, or venture out into international waters on a cruise or gambling ship. A beach restoration project in 2015 makes our private little beach ideal for sun bathing and swimming. For more 'action,' the famous Clearwater and St Petersburg Beaches are nearby. In between are the quaint Greek fishing village of Tarpon Springs and the art community of Dunedin. Also nearby is the world-renouned Salvador Dali Museum and the Tampa Performing Arts Center and Aquarium. Disney World and Busch Gardens are easily accessible. There are dozens of restaurants within a few minutes drive (don't miss our succulent local grouper and gulf shrimp and oysters) as well as any kind of shopping you might want from discount outlets to luxury boutiques. Monthly or shorter-term rental is possible. Please call or email us for details. Please check the availability calendar below before calling. We fell in love with the Florida Gulf Coast and wanted a place directly on the open water, with beach access, heated pool, and tennis courts. Gulf Island Beach and Tennis Club is perfect for us -- the only resort of its kind in Pasco County. We bought this place for ourselves and use it a lot, we also have a home in Maryland. We're happy to share our Gulf Island condo with friends, old and new. Our children and grandchildren are in Tampa, and that's what drew us to this area initially. But the more we visited, the more we wanted our own slice of paradise. Tampa is a vibrant city and the Tampa Bay area has a tremendous amount of activity of all sorts. But the little town on Hudson still has some of the charm of an old Florida fishing town. Commercial and charter fishing boats sail in and out of the little harbor every day. The fresh fish in the local restaurants is phenomenal. And the shrimp & oysters -- WOW! Local prices are remarkably low for food and services. And Everyone is So Friendly. Gym, club house, marina, 4 tennis courts. We can’t say enough good things about this condo and it’s owners. We had a wonderful holiday. The condo is gorgeous with high end furniture, linens, well stocked kitchen with great dishes, good quality pots and pans, cutting boards and sharp knives. The owner left us all the condiments, soaps, laundry soap (yes it had its own washer and drier) etc etc. which saved us a lot especially because we were only there 15 days. The view from the balcony overlooking the lagoon was wonderful and many times we watched dolphins and manatee as we had our morning coffee or afternoon cocktail. Sunsets on the Gulf of Mexico were breathtaking and I took many pictures outside the front door. The location is perfect, the pool nice and warm and there is even a sand beach with Adirondack chairs. We felt very secure with the gate guards and security. We just spent a week after contacting the owners with a short notice trip. The owners were extremely helpful in answering questions and offering great advice on restaurants and things to do in the area. The condo is well stocked with all the things one would need. It was extremely clean and very nicely decorated. The best thing is thing is the incredible view from the balcony....great for wildlife lovers. In the lagoon were dolphins , numerous water birds, and also a visit from two manatees. Highly recommended! Thanks Marilyn and Stuart. Carol C.Where do you live? The condo is exactly as it appears in the photos. It is clean and nicely furnished, comfortable and cozy -- we felt at home right away. The complex is secure with good facilities. We walked around the lagoon trail, swam in the huge saltwater pool, used the gym and games room, and played the piano in the clubhouse. The balcony is very private, with comfortable chairs and a great, unobstructed north view – perfect for sketching/painting. When the weather is warm you can open the doors to get a cross-breeze and when cool there is an electric fire. The mirrors are wonderful as they afford a Gulf view from almost anywhere in the condo and make the rooms feel much more spacious. Each bedroom has an ensuite bathroom and the split design gives everyone privacy. Having the washer/dryer in the unit was a great convenience – so nice not returning from vacation with a mountain of laundry. Good TV – very important as we were there for both the Superbowl and Sochi Olympics! Little touches like the indoor/outdoor thermometer, WIFI and free calling anywhere in North America were appreciated. The landlord, Marilyn, was responsive, pleasant to deal with and our deposit was returned in a timely fashion. It was a very relaxing, hassle-free vacation. We really enjoyed our month stay in this condo! It was very clean & beautifully decorated. We loved the view from the balcony & watching the sunset every day. We appreciated all of the amenities, like HDTV, internet, washer & dryer in unit, & free long distance. There were several great restaurants nearby which we also loved. We would highly recommend this condo! Every direction has a different water view-ever changing depending on time of day and always great, plus many different types of boats. In addition to several interesting sea birds in the area, there are dolphins & a manatee in the lagoon. That was awesome, too! The décor & color and style co-ordination of everything in the living room, dining room and master bedroom is amazing. There are a lot of little extras that make spending time here great. We liked the indoor/outdoor thermometer, the magnifying mirror, Hi-Def TV, storage containers and a lot of other items that most condos don't have.The condo was very clean as were the common areas and the landscaping is well maintained. Everything was in good working order, fast internet & no problems encountered during our month long stay. The kitchen had everything that could possibly be needed for meal prep and serving. It was nice to have so many dishes and glasses & everything matched but there were so many items that not enough room for groceries was left. I was disappointed that there was owner food left. There is an additional computer desk and filled metal file cabinet not shown in the photos of the spare bedroom. It was great to have a computer desk and comfortable, adjustable chair The extra office furnishings gave us the uncomfortable feeling we were using someone’s private office. The closet in the second bedroom was crammed top to bottom with all kinds of stuff, most for owner use. There are no bathroom doors for sink areas so this area seems like part of the bedroom. My husband and I prefer privacy when using any part of the bathroom so we didn’t care for this design. The cardio equipment in the gym is good and has a wonderful view of the lagoon and gulf. The pool is very nice. The beach was disappointing with little sand and covered with seaweed. Everybody we encountered during our stay was friendly and having guarded gate entry to the premises made us feel very secure. There is every store you can imagine within 10 miles and lots of good restaurants nearby. We especially lot Argentos and Inn on the Gulf. Marilyn was very nice to work with and we received our security deposit back within a few days of check-out. Gulf Island Beach and Tennis Club is a self-contained, gated vacation paradise. In addition, it's a short drive to: Clearwater and St Petersburg beaches, Tarpon Springs, Disney World, Busch Gardens, Sea World, Tampa Aquarium, museums, downtown Tampa and Tampa Performing Arts Center.